At seven am the phone rings lifting me out of a food-induced sleep. Day five of my luxury getaway on the Mayan Riviera is dawning and I am beyond irritated to receive an early morning phone call during my fancy-lady escape from reality. My opulent room comes into focus through my one opened eye. Face glued to the pillow, I reach for the phone, clear my throat and prepare to mutter, “No,” and hang up. Did I agree to an off-resort day out with my travel companions? Yes. But that was before the full-service resort treated me to a Spanish dinner celebration prepared by Michelin Star Chef, Manuel Berganza. He came all the way from New York City, guys. I had to! After being stuffed with nine courses paired with Spanish wines and signature cocktails, I returned to my room to sleep off food-triplets. Before entering my food coma, I packed my bag and set an alarm for the next day’s excursion. But somewhere between lights out and the wakeup call, all bets were off. Or so I thought. 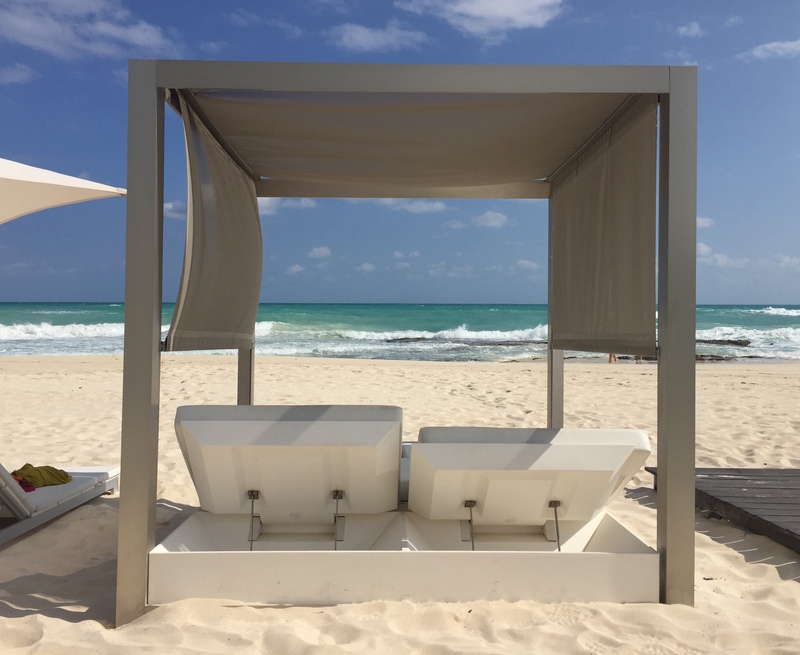 You see, I am Constanza-level ensconced at the ultra-luxe IBEROSTAR Grand Paraiso on the Riviera Maya. I have a butler, a private terrace, a beachfront cabana and they bring me breakfast in bed. Mix that with last night’s welcome overindulgence and I have become a stage-four bailer. I’ll apologize, pay my share of the rental car and be snacking by the ocean by noon, I think to myself. “Are you sleeping? Get up, we’re going to leave soon. You still have time to make it. We’ll wait for you,” replies the chipper voice on the phone. I deliver my regrets and an apology and prepare to relax back into sleep. “No. You’re coming. You have to. It’s going to be fun,” the voice persists. My unrelenting travel companion perseveres, chipping away at my dream of floating in the pool between naps and coffees. I need this person when I’m on deadline, not when I’m on vacation, I think to myself. Moments later I am sat, eyes burning, in the front seat of our rental car, clutching an Americano headed to breakfast in Playa del Carmen. 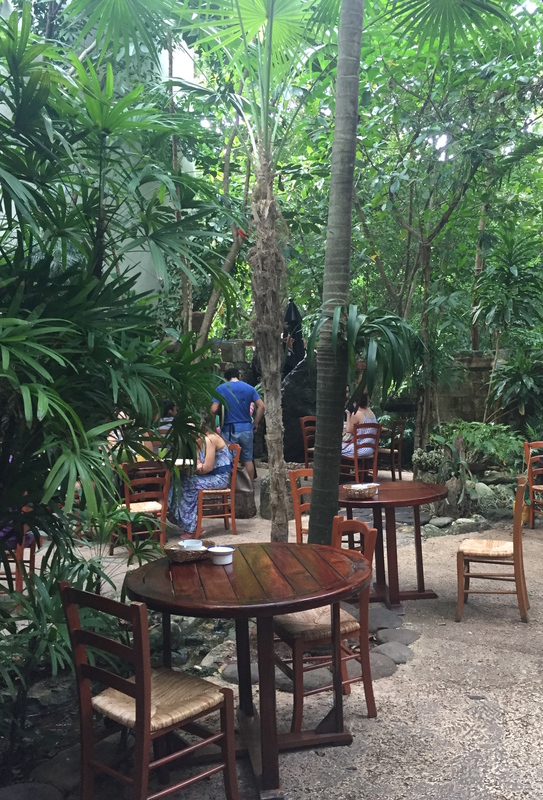 We travel a short distance down the highway to our first stop: brunch at La Cueva del Chango, a jungle-esque eatery just off the main pedestrian strip. Serving up proper Mexican dishes, La Cueva del Chango is built seamlessly into the surrounding vegetation to deliver a whimsical tree-house atmosphere. Tables set under the sunny sky are surrounded by large palm trees, fish ponds, lush green vegetation and blossoming vines. I’m told the food here is great but the juice is legendary. I try the orange and guava juices and forget momentarily about my empty beach cabana back at the resort. 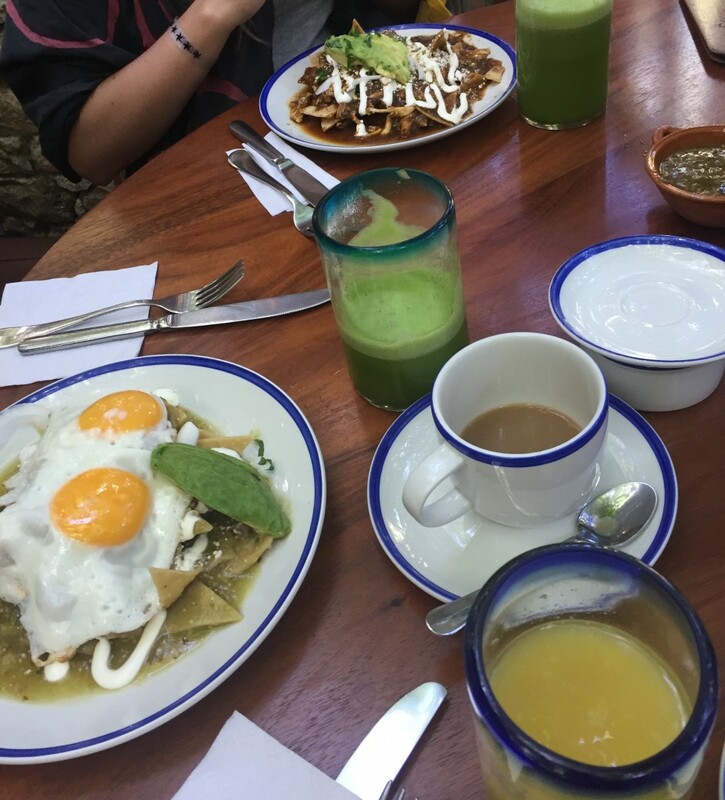 Breakfast is Chilaquiles, lightly fried tortillas topped with eggs and shredded chicken simmered and dressed in green sauce. A waiter sets the thoughtfully prepared dishes on the wood table creating an earthy and delicious food-tableau. Nourished and enchanted I find myself in good-ish spirits and ready for the next stop. 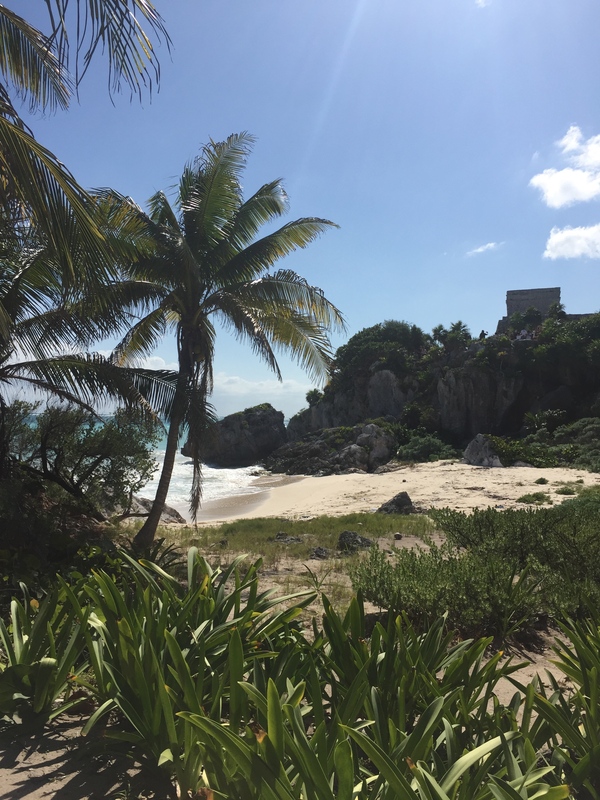 Back in the car we head for legendary Tulum in search of the area’s ancient seaside ruins. We arrive to find ourselves in a buzzing market filled with Mexican blankets, maracas and skulls all awaiting emigration to their new owner’s home country. 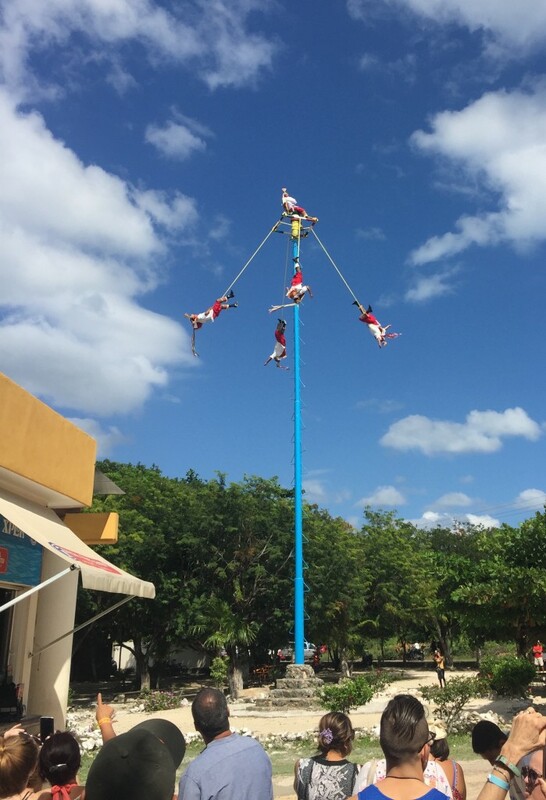 As we leave the tourist pre-game area, headed for the ruins proper, we happen on an unusual scene: five men in traditional clothes free-climbing a four-storey blue pole. At the top, the eldest man takes a seat and begins casually playing music while the remaining four tie themselves off with ropes incapable of meeting Canadian safety standards. Tied in, the men launch themselves off the pole, each spinning high above the ground forming a human mobile. They spin, twisting into acrobatic shapes, ropes unravelling and approaching the ground until each makes a gentle, if not bored-looking landing. Satisfied that this is the strangest thing we’ll see today, we make our way down a path to an ancient stone wall built seven metres thick. We enter the ruins through a narrow, dark tunnel in the wall. It gives way to a wide open space peppered with ancient structures dotting a seaside cliff. Here you won’t find the massive, scary-stepped temples typical of the Mayan Riviera but rather a series of smaller structures. Perched on a cliff above the crystal blue ocean and home to a seemingly untouched beach it’s no wonder the Mayans chose this site for their temples and homes. We explore the ruins and leave under what has become an intense midday sun to enjoy the beach in Playa Paraiso. 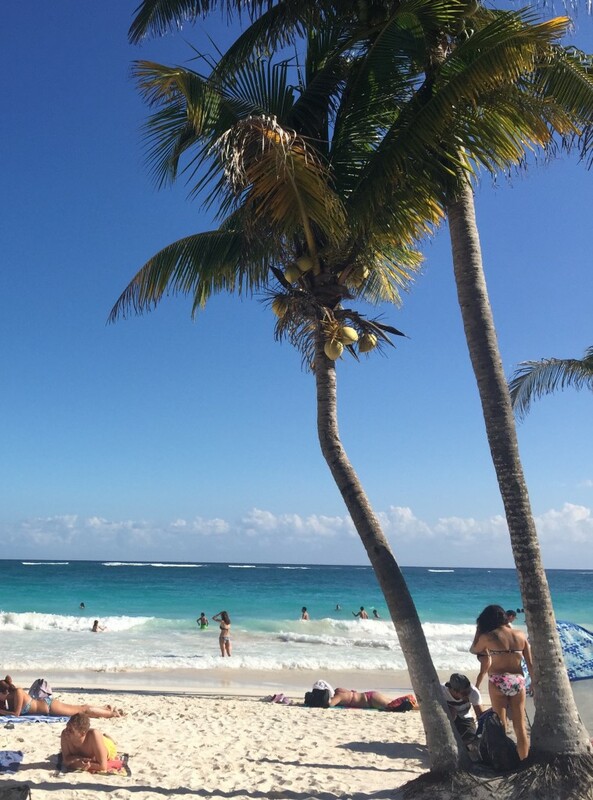 Playa Paraiso is a popular spot for young travellers, yoga-idiots and grouchy writers like me. It’s also a place where you’ll find locals relaxing after work, meeting with friends and enjoying the beach. The long, sugary-soft, white sand beach is lined with restaurants and clubs who will welcome you to recline on lounge chair for a fee. Because I am hot, exhausted, and still digesting three meals, I pay top dollar for an ultra cushy, double-wide rattan beach sectional. Under the shade of a tree I lay down to take in my surroundings. People are chilling hard. Locals, travellers and people of all ages carry on in English, Spanish and German as they enjoy a peaceful moment on planet Earth. I nap until the sun begins to set. But we have one more adventure planned. Our last adventure, not far from Playa Paraiso will test my second worst travel deficiency: seasickness. Gravol in my belly, I board a nimble catamaran bound for a two-hour sunset tour. I warn my fellow travellers that today might be the day I ruined by barfing on someone. Our captain is beyond tanned and has the look of a person with no occasion to wear socks and shoes which is to say, he’s relaxed. We set sail bounding from one pontoon to the other over rolling waves, the sun falling in the sky behind us. The ocean is exquisite and the shoreline puts Mexico’s incredibly beauty on full and glorious display. Further out to sea, the water is rough. This makes me nervous but a look back at Captain Relaxed–who is looking very relaxed indeed–sets me at ease. 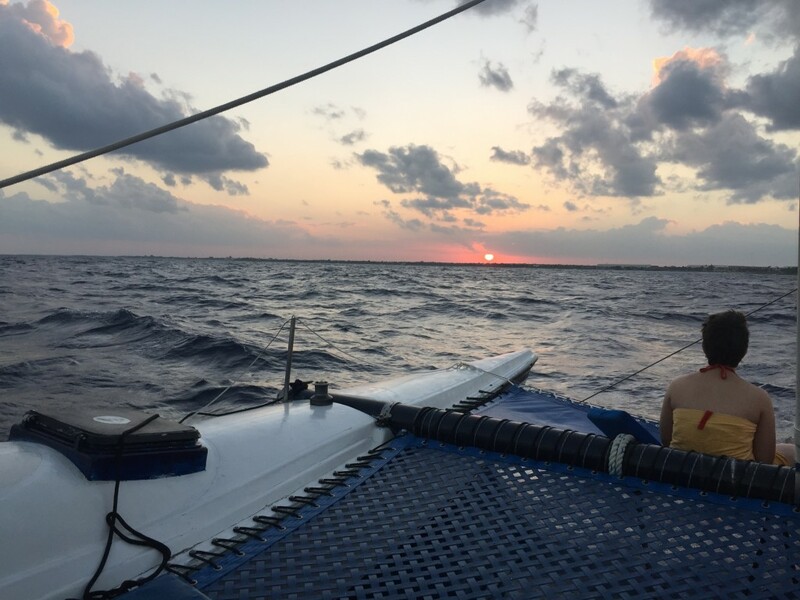 At the midway point, we sail into a quiet bay and drop anchor. Here, we are free to jump off the catamaran, swim around, drink beer and enjoy the remaining daylight. Gravol doing its job, I dive off the boat several times, splash around and eat some chips. Pretty good day for me. Moments later, we up-anchor and head back out on the waves to catch the sunset. Captain Relaxed positions us perfectly in front of a glowing sun hanging just over the horizon. There, we sit quietly, bobbing on the ocean until the radiant orb disappears. Day done, I sit reflecting on our activities. Someone barfs. It is not me. It’s late when we arrive back at the resort. I head to the spa for a coffee and a soak in the hot tub feeling grateful for the day I nearly missed. 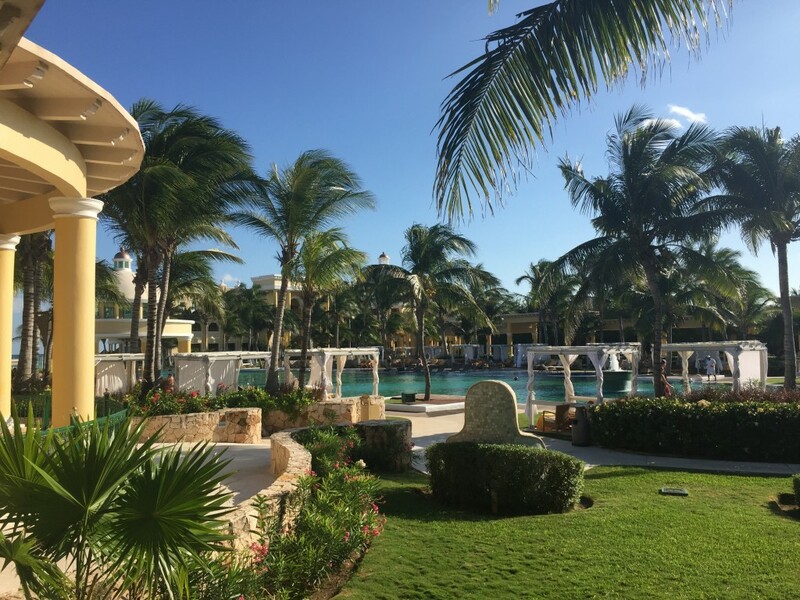 Disclosure: The writer was a guest of IBEROSTAR Grand Paraiso. The hotel did not approve this article.